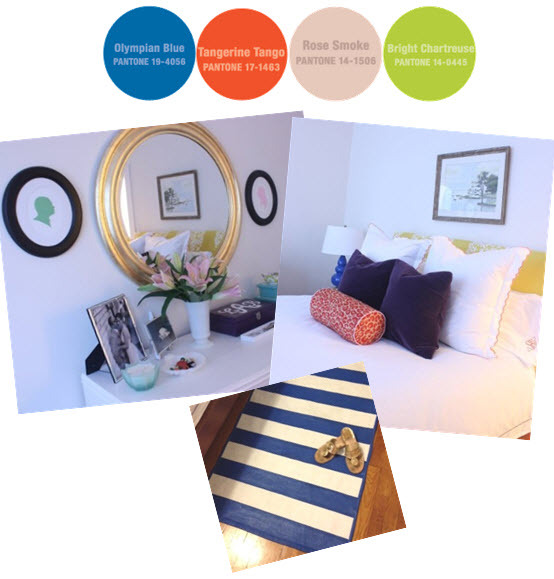 How excited was I when I checked my email this morning and noticed that the Fall 2012 Pantone colors were announced and that I was right on par with the "it" colors I picked for my bedroom? Very excited I tell you. Oh, and so you don't think your eyes are playing tricks on you, my headboard really is a bright chartreuse color, but alas the camera doesn't show it that way very well. I guess I could even count Ultramarine Green as one if I'm including the silhouette art AND the honey gold if I'm including the mirror. I love the picks for this Fall. What are your thoughts on them? Great minds....your color choices are spot on. So many wonderful combinations here! Love them! The mix should please just about anyone with a wide selection to choose. I love your colors! We knew you were good!! And now Pantone confirmed it!! The colors you chose really are lovely and work so well together!! They're great color choices! If you have a sec, I'd love to hear your thoughts on my latest posts and don't forget to enter my giveaway! Your blog is so wonderful...do you have twitter or fb? ?